I ended up only getting the kids’ bathroom floors and baseboards done today. Because it was really, really icky! Oh Crystal I’m sorry! I only have a girl but many years ago my sister told me how she cleans the bathroom in a house of men and I’ve kept it in mind ever since (her bathroom never smells). You have to clean the wall and cupboard that surround the toilet. Make sure you get the floor too. And then there is X-O . Biodegradable, organic, and all that good stuff. I used to use it clean up after my cats and boy it works! Keep us posted on what you end up doing. I think this tip is likely spot on! Yes, wipe the walls, cabinets, ALL surfaces. Get this…daily. (It will become a quick habit, trust me) That smell will seep into grout and wood and crevices and be impossible to remove if you let it set. My friend with multiple boys just had to re-floor, re-paint, and replace the vanity in her bathroom. She was a diligent cleaner, but baby #4 did her in and she let that one bathroom go for a while. Also, I have always hated those carpets that surround toilets. They gross me out. But with boys they are a life saver. You just pop it in the washer every few days and they air dry in a short time period. Well now, isn’t that smart!? This is a seriously good point. Wipe all the walls! I had no idea about this until my husband taught to son #1….they literally shake the last dangling drops off them! 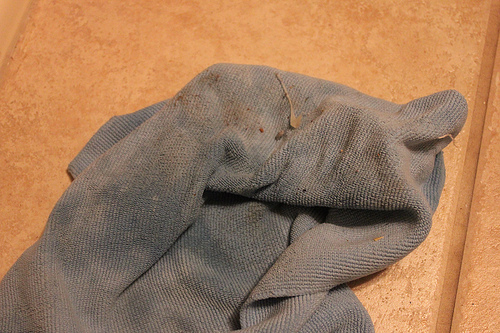 …That explains why I found our bathroom wall to be super nasty when I did our pre-move cleaning! LOVE this advice! Even my 4 year old has to clean up his mess. He doesn’t like having to clean, but I’m hoping it will make him pay attention a little better. That worked with his older brothers! This is what I do with my son. As soon as he was potty trained I worked with him to make sure he wiped up any and all “misses.” Now that he is eight there are almost no misses at all but when there are he cleans up automatically. I wonder if him sitting down in the middle of the night is an option? My friend says even her husband does that because he misses when he’s sleepy. Boy bathroom smell? That’s an EASY problem to solve. Have your little boys SIT DOWN when they pee and have them pee IN THE WATER. When they get old enough to aim where they should, without a problem, then they have earned the privilege of standing up. I agree. I have 4 & 5 year old boys, and they are not allowed to stand up. I tell them, “If it has a seat, then you SIT DOWN.” Their dad is not in the home so they have not been given any formal training on the art of standing up yet. that’s what we had to do…teach them to sit until their aim improved. Thank you, ladies! I am sharing this with my husband. I overheard him telling our five year old to stand up and pee and (in my mind) I was shouting NOOOOO!!!! He does everything in such a hurry there is no way this is going to end well. Lisa, My husband said the same thing. Now HE cleans that bathroom. Or, he is SUPPOSED to keep it clean(but doesn’t). We tried having my youngest(now 8) sitting down again, but now he just pee’s over or under the seat he is sitting on. I really just think that he doesn’t care. He even cleans up the mess but continues to do it. Another vote for sitting down. In our house ALL boys sit down! (I have 2 sons) My husband was raised that way and so was I (my dad and brother sat). I always have to clean the bathroom after our boys have friends over! Ditto to the sitting. My husband’s family was raised that way and it totally eliminates all the grossness and smell. My husband always says, “Who declared that men have to stand anyway?” But if you don’t want to make them sit, I second the suggestion of wiping up the walls and floor area around the toilet really well. This is what we did when we used to clean for other people and it worked well. Rather gross though! Another vote for sitting down. My 5 year-old has just earned the right to “practice” standing to pee, with supervision. The practice sessions are less for aim (his is pretty good) and more for consistent clean-up of any dribbles and splatters. When I feel he will consistently clean up after himself, I’ll let him “practice” without supervision and we’ll see how it goes. I wanted to make him sit down indefinitely, but his father thinks it’s time, so we’ve compromised. In a house of 4 boys and a hubby – sitting is the standard. =) Sure makes a difference! Yes!! I was totally going to share this! My husband was raised that way and so that is how we potty train. It would have never occurred to me otherwise. sitting is the answer. I have three boys (6, 10, 12): all sit=no mess. But if not, the entire area around the toilet needs to be wiped/cleaned etc often. my answer was, yup, and he did his thing and we were on our way! I have taught my boys to pee sitting down as well. When they got a bit older, they figured out that other boys stand(including dad) and they made the decision themselves to stand. I was ok with it, since they had learned to aim by then. I guess I am really fortunate that non of my boys (including dad) have an aiming issue. They even pee right through the seat. I hardly ever see droplets on the seat from my boys. my husband and I taught our boys to sit down as well. my husband can’t stand cleaning up their mess anymore than I can. YES! That’s what I keep saying!! My mom AND my dad always had my four brothers sit down. My dad always sat. It only took one time of my dad’s uncle explaining that when a boy doesn’t sit that the urine ends up on the floor, which ends up on the shoes or feet, which ends up being traipsed through the whole house. My dad never stood again. My future boys will learn to sit. So glad that I’m not the only one! Sitting hasn’t worked for us, because my youngest gets lazy and doesn’t hold his part down and manages to leak under the seat??? (How that is possible is beyond me!) I’ve been trying all I can to get him to stop. Cleaning it up might be the trick, (duh) I don’t know why I didn’t think of that! Thanks! This is my rule too! I would literally cry when I walked into the downstairs bathroom it was always so gross. I finally made a sign that showed a stick figure standing up with a crossed out circle over it and said NO STANDING UP ALLOWED!!! and taped it to the toilet. It worked! My 4 year old and 6 year old boys know that they have to “earn” the priviledge of standing up by being able to do it without a mess! The bathroom is WAY easier to clean now! 🙂 I have 4 boys and they are all potty trained. I know exactly what you are talking about! Can you take the seat off the toilet to deep clean? Some seats have an easy off hinge. If you can take it off you should be able to deep clean. Sometimes “stuff” gets under the hinges. A natural cleaner I’ve been using that smells good is Meyers All purpose Cleaner in Basil scent. Seriously basil, it’s the best smelling cleaner I’ve ever used. You mix it with water in a spray bottle. I can’t remember the price but I found it at Target. Because its mixed with water it lasts awhile. I would spray it around the toilet, let it soak, and then wipe. If you have a haan steam mop they are AWESOME for tiled floors around the toilet area and no cleaner needed. Yep- I agree. Take the toilet seat off and clean all the nasty under the hinges. Same goes for the bolt covers at the base of the toilet. I have two boys that use our main bathroom. I keep clorox wipes (and normally i am a norwex girl) on back of the toilet so if they miss they can clean up. However, this doesn’t solve how it seeps under the hinges. I have a new years routine, every one else makes resolutions, we change toilet seats out on every toilet. Some of my friends called me a germ a phobe at first until they had boys! I also found it tended to make a puddle on the backside of the toilet where the toilet bolts into the ground. Our toilet does a snake around thing back there, and i have to clean those curves real well as well! Once i figured their misses puddled up in the one corner of the toilet by the bolts, the smell went away! We also have caulk in front of the toilet between the floor and the toilet, and i try to watch that. When it turns yellow i replace it. If your shower curtain is by your toilet, wash it as well! Finally, watch what cleaner you use. I think it was a lysol spray that i used that made the smell almost worse! When i switched cleaners the smell went away. I am still in process of finding a cleaner i like for the bathroom, so i can’t recommend one, but the bathroom toilet after boys is the only place i do use cleaners in my house! The rest of my house i do use norwex, but something about boys and urine, break out the good smelling stuff! I nanny for 2 little boys, and we have had many discussions about the pee thing. I am a stickler about this…do NOT clean up their pee! The more they have to do it, they will start paying attention more. If it is cleaned up right away it doesn’t have as much time to seep in the tile and grout AS much. We keep Clorox wipes on the back of the potty for that very reason. (I do go back and make sure it is all gone, but they don’t know that) We have had half hour stand-offs about cleaning up the pee. Too bad! I tell them that if they can aim it to pee on the smallest rock or moving bug outside they can hit the HUGE hole called the potty. A little tough love, but I always tell the oldest one that his future wife will call and thank me one day. I had forgotten about this! We are not sitter-downers (ha), but my husband trained our son from the beginning of potty training to wipe all messes. It really does work. My son is not messy, and it must be this training. However, when we have play dates, I know I will be wiping the entire bathroom and washing the rugs when friends leave. It is because they sometimes miss and you don’t know where it went. The walls and the cabinets around the toilet need to be cleaned and another thing is to make sure that the calk around your toilet is well sealed if it’s not sometimes you can get some yuck under the crease of the toilet itself. I have one daughter and four boys and so get this. The best I have found is a hydrogen peroxide, lemon juice, baking soda paste spread on grout then sprayed with vinegar. It will fizz, then scrub with a scrub brush or toothbrush. It really gets rid of the smell from the floor. It may help you to grout around the base of your toilet. While it prevents the ability to see leaks from under your toilet, it keeps the urine from running under the toilet where you can’t clean it. Once you have your grout really clean, you may want to reseal your grout to help provide a barrier. Good luck with this! It’s an ongoing battle. I’d heard this trick before, several years ago before my son was even potty trained, and I’d filed it in the back of my head, but all I could remember was “lemon juice” and “around the base of the toilet.” — so I was pretty happy to find this “cure” again. I just did it tonight, because my spidey-senses tell me that my son has gotten sloppy, and it worked like a charm! Even my keen sense of smell can’t pick up the urine scent (hooray!!). My first thought was Febreeze! Honestly, when I worked hospital-side, I remember there was nothing worse than the odor of a GI bleed. I used to have the pharmacy send peppermint oil. I would dab some on a cotton ball and put it in a med cup. I’d place them all over the unit. The peppermint oil would overpower the odor of the GI bleed so, I’m thinking it could take care of any odors you might be facing. As far as keeping the bathroom clean, good luck with that! 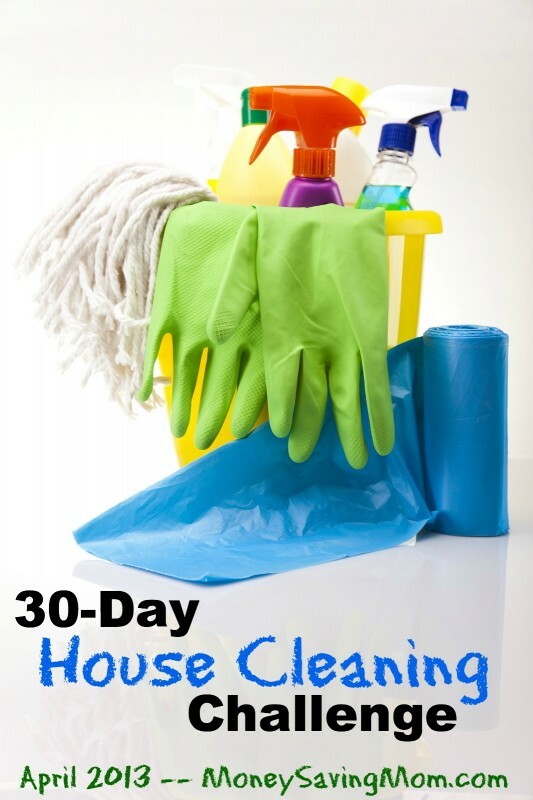 This series has me thinking more about accomplishing chores in small batches. So, when I decided to steam my asparagus and cauliflower tonight, I decided to also steam clean my kitchen floor. By the time the floor was done, the veggies were too! I agree; peppermint oil is the best for strong odors! I put it in white vinegar in a spray bottle to clean the bathroom. I also keep a small spray bottle of distilled water and peppermint essential oil on the back of the toilet to use for air freshener. It kills odor like nothing else I’ve tried. As a side note, if anyone’s dog ever gets skunked, peppermint Dr. Bronner’s is the best thing to wash them with. A friend ran over a skunk and that’s what he used to wash his truck. Peppermint for the win! Funny comments. My little boy is 3 and is currently sitting. I’m thinking I will keep him sitting for a long time. And I agree with the “everyone clean up their own pee philosophy”. That’s what I plan on doing, anyway. Hope it works! Also agree about making him wipe it up. Not the deep clean, but the misses on seat and floor. He’ll get the hint eventually. Have you tried using your wet Envirocloth on it yet? Get it good and wet and scrub. If you are finding it is remaining, the Odour Eliminator or Sportzyme are both great enzymes to break down and eliminate organic residues that cause the “boy” odor. The smell comes from “misses”……The solution….. Fruit Loops cereal! Putting a few Fruit Loops in the toilet gives them something to target practice for. It makes it a fun game and they enjoy aiming for them right into the water. When my son was little–I would put a few Fruit Loops in the toilet at a time. I just kept a sandwich baggie of Fruit Loops in the bathroom cabinet and would put them in periodically throughout the day. P.S. I used Fruit Loops instead of Cheerios due to the bright colors of the Fruit Loops. 100% agree!!! We used cheerios. I kept a small container on the back of the toilet. He has excellent aim, and we’ve never had a smell issue! This is brilliant! My little man isn’t to potty training age yet, but I’m definitely going to have to keep this in mind for when he is. I’ve found that orange oil vinegar works awesome for baseboards…and a bazillion other things…kitchen cabinets, counter tops, my dining room table, etc.! It’s seriously my new favorite thing. Have you tried it yet??? I only had girls, so I can’t help with the dilemma. =) However, I’m right there with you on those baseboards. Though I didn’t picture mine, I scrubbed all the way around! What is that stuff anyway?! In my case, hair spray, probably! Oh well, it’s gone for now! I know some folks may not care for a more harsh cleanser, but I am all for bleach to take care of the germs and the odor. Clorox Clean-up works great, and I agree with the other commenter who mentioned having your boy clean up with Clorox wipes. Lysol or Chlorox wipes are your friend! I’m the mom of 3 boys, and it takes awhile for them to get better at aiming. One thing I will suggest – If you have a wooden toilet seat, replace it with a plastic one that easier to clean around the hinges. We found that the wooden seat seemed to absorb the smell and we couldn’t get rid of it no matter what we use. Since we switched to the plastic seat, we can wipe it down with a wipe and the smell is gone. The one thing I would say about any wipes is that they don’t seem to get up enough of the mess and you are left with smell. If it’s just for a swipe by the boy, that’s one thing, but don’t count on any wipes for helping you get rid of the smell. Love that you’re using your enviro cloths from Norwex. They have a few enzyme cleaners that will organically eat away at the odor. My little boy sits down to pee so we don’t have to worry about aim and the smell at our house, at least for now. But I have seen a recipe for boy bathroom smell cleaner. I think it used lemon juice, baking soda and you make a paste and rub it on where the smell is coming from walls, base of toilet. Then spray after it sits a while with vinegar and wipe down. I am sure I could find the recipe again if you want the link. I should have added it to Pinterest. umm. . .wait for him to grow up and then move?! Seriously, 2 points–if it isn’t caught early, it is extremely difficult to get rid of (as in remove the floor). That said, “sit whenever you use it” is a great rule for little boys. I find pee in the oddest places around my toilet from my son. When I clean the toilets I spray cleaner all over the toilet and the surrounding floor and let it sit for a few minutes (I use Biokleen All Purpose Cleaner) and it seems to keep smells at bay. But you know what? Nothing is a bigger magnet for wayward pee than a freshly cleaned toilet. I use a mixture of 1/2 vinegar and 1/2 water and I put it in a spray bottle (I use it to clean everything). I wipe down the floor, toilet, side of the cabinet and the walls and baseboards with it. When it dries you don’t smell the vinegar or the boy smell. As part of my son’s daily chores, he takes a squirt bottle of vinegar and water and a rag in the bathroom and cleans the “yellow.” I am amazed by how much the “yellow” has disappeared before he even cleans now 😉 The smell is better as well. I also clean the toilets with vinegar and freshen with a couple of drops of lemon essential oil. I also have a Scentsy plugin that we turn on when we have guests. We use a spray bottle with half vinegar and half water – spray EVERYWHERE, especially in between the tank and the seat, around all of the caulking, the walls, floor, cabinet, etc. It worked for us! I have 4 boys (soon to be 5). We wipe down the walls around the toilet with a micro fiber cloth & Lysol all purpose cleaner every week. Yes, natural cleaners/deodorizers work great. And I agree with the mom about the hinges. It gets everywhere. Also, remember the little caps that cover all the hinges and screws around the toilet seat and the base. These are good areas for the pee to hide as well. I swear, in the middle of the night my boys use the back of the toilet much like a basketball player uses a backboard. I have three potty trained boys (3, 8 and 10). I am also an advocate for having them clean their own bathroom, but I am also aware of their ages and I will go in there to “deep” clean in it the way I want it done. I can’t really expect the 3 year old to clean great at this point but at least he will get the idea. Yeah, I find the nighttime bathroom runs are the problem for my son…sometimes I don’t think he is even awake. As a mom of four boys I know that “smell” well. After I do the normal basics I use a hand held steam cleaner to clean the potty. The steam gets in all the nooks, hinges, etc. makes a huge difference. I have 4 boys and a girl. All of the boys have grown old enough and moved out now. But one thing that works to fight odor from anything is “Odo-ban” which can be found at Walmart or Home Depot. My husband used to try and febreeze everything, to the point that I can’t stand that fragrance anymore, but the Odo-ban doesn’t just mask the smell, it actually makes it go away permanently… well, until another smell is made to replace it. lol Good luck! One of my son’s chores every morning is to clean all around his toilet and the floor with a Clorox wipe. Now I never have to clean up the messes when I clean the bathroom, and he is learning quickly to have better aim. And because he does this chore daily, the mess is never there long enough to create an odor! My 5-year-old son’s “break through” was when my husband told him to look at the hole in the bottom of the toilet (where everything flushes down) and don’t look up until he is finished. We haven’t had a mess since. I keep a swiffer wet jet at the side of the toilet loaded with Febreze and scrub down any spills immediately. My boy has a pretty good aim, when he’s sleepy and off his aim he generally opts to sit down anyway. I also started to keep a Scentsy plugin in the bathroom. Sometimes even when I know everything is clean I can still smell it!!!! Odoban…I moved into a house that was previously filled with cats-worked great! Oh, and I have 5 boys, 8 and under, 4 of which are potty trained, well mostly…Odoban works. The best thing I have found is Clorox clean-up. It gets rid of the smell. I have not found any other cleaner that will completely remove it. It will bleach out anything it touches, so I am usually the one who uses it. I have used it on baseboards, walls, vanities, trash cans. I have even had to clean my toilet brush before I could use it. Boys go all over! All of the bathroom closets/cabinets are cleaned! I am getting such great ideas from all these comments. Thank you! Good question and good tips everyone! I had resigned myself to living with the smell (and cracking the window/lighting a candle when we have guests). I thought I would just have to wait until they are moved out and then redo the bathroom! I’ll give these tricks a try…3 boys…7, 4, 2! Not sure if this was already mentioned, but the last place I found (after cleaning everywhere else and still could smell it) is underneath the narrow area where the tank almost touches the seat area (?) behind the hinges. Have to use a washcloth (Clorox wipe wasn’t strong enough or wide enough) laid flat and pulled side to side, pulling under the tank. Hope this makes sense. Also agree with the hinges, if yours, like mine, don’t come off (Or like me, don’t know how). Spray with what ever you clean with and let it kinda run down into the hinges and then clean underneath the area where they attach, the bolts. 3 boys, several apartments through the years. A little off subject, but have you tried the ‘Clorox Bleach Gel For Laundry’ I love it! I dont use it for laundry though, ( I don’t have a bleach type dispenser.) But I use it for grout lines in the bathroom and kitchen. Since it’s a gel it stays wet longer. So it soaks in longer and really whitens the grout Cheaper than the bleach pen when you want to clean grout in the entire shower. I have 5 boys (soon to be 6) and oh that smell!!!!!! I feel for you. Even with one boy it is there. We have to wipe it down every day….which by the way I DO NOT do! My 10 year old son is in charge of that. But, like many others have commented, it is a must to wipe down the walls, toilet bowl inside and out, not forgetting to get where it attaches to the floor, toilet tubing that attaches to the wall, and vanity!!! My boys use bleach wipes when they are on sale otherwise they spray it with cleaner and wipe it down. Every so often I remove the toilet seat and clean that thoroughly. Also fold your rag over and run it under as far as you can between the tank and the bowl. You will be amazed at every place that urine can go!! It is just gross!! I also make sure mine can aim properly before they are allowed to stand. That helps but it seems like there will always be splatters if you do let them stand. LOL! Our boys sit. I did not hear this story till a few years after it happened- Our 3 year old was in the 3-5 year old age program at church Wednesday night. They always took a potty break. The man that was in charge of the boys bathroom finally went looking for my son because he had not returned to the line in the hall. He found him sitting in a urinal, swinging his legs. YUCK! How nasty! If we had known what he had done we would have scrubbed him down after we got home. Motto of the story- make sure your boys know what a urinal is for. Oh my gosh! I have two boys, one is potty trained and I never realized this was an issue with having boys! I’ve recently started noticing a “smell” in their bathroom, even after cleaning it and wondered what that was. First thing I’m going to do is get rid of the bathroom mat! Life really is interesting in a house full of boys! lol! I have 3 boys ranging in age from 12 years to 9 months, so the “boy bathroom smell” is a long familiar odor to me. (Train your kids all you’d like…if you have a barely awake tween-ager using the restroom in the morning, they’re going to dribble and probably not wipe it up. I pick my battles, and at this point, that is not one I choose!) It comes from a boy’s innate ability to somehow get drops of urine in every nook, cranny, and hard to clean spot within 3 feet (sometimes farther!) of the toilet. So yes, the caulking around the bottom of the toilet, the hinges of the toilet seat, the bolts that attach the hinges (it took me forever to find these nasty things, since they are hidden underneath), the little space underneath the tank that I never knew was there until I had boys, the floor and grout of the floor, the baseboards, the wall BEHIND the toilet (and on either side, depending on how your toilet is situated) and in extreme cases, even the ceiling!! I was grateful when my husband found the toilet seats that unlock and you can take off to clean the hinges well (whoever invented this was either an OCD cleaner or had boys), as this helped make my job of cleaning the boys’ bathroom WAY easier. That’s right, I said “boys’ bathroom”, because that was also part of a solution for us…they have their OWN bathroom. (With 4 kids and me working from home, it’s nice not to have to worry about cleaning the bathroom DAILY so that guests don’t have to endure the joys of boy bathroom-ness. I realize that this isn’t an option for some, but just throwing it out there!) 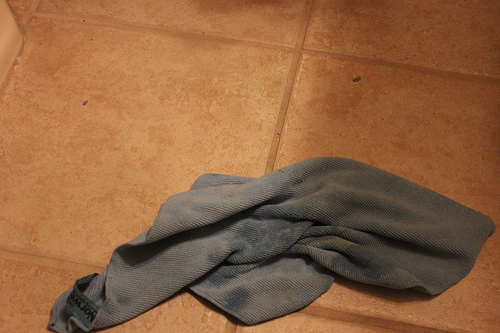 As far as a toilet rug…in my humble opinion, the rubber bottom seems to merge with the urine on a molecular level, so that not matter how many time you wash it (or pre-treat it) it never fully comes out…so I ditched the rug LONG ago. Also, I found some AH-MAZE-ING cleaning products that clean fabulously and got the smell out of the areas that other cleaners couldn’t. I can’t use bleach because of my severe asthma, and my oldest is autistic, so he doesn’t tolerate strong chemical smells well…plus cleaners with bleach are so toxic and even the vapors are super bad for you! After trying lots of “homemade cleaners” that cleaned decently, but didn’t cut the mustard as far as cutting the smell (so in my book, that’s not clean enough) I found Tub-N-Tile and Sol-U-Mel!! They are natural cleaners that work fabulously and I love that I can go to town cleaning in the small space of a 1/2 bathroom without feeling like I need a gas mask or have to take “breathing breaks”! So I would recommend them everyday of the week and twice on Sunday…just be sure to clean all those nooks and crannies to keep the smell away long term! I thought it was only me for so long. lol The boy smell is everywhere. I’ve actually made “targets” (I cute out shapes with cheap construction paper varying in size, remnants from other projects etc) I placed them in a potpourri type dish on top of the toilet, when he has to be he pics a target or 12 and takes aim. Keeps more of the pee in the toilet and less splatter all over the place. Its been a few months and he still finds it interesting. I also got the scrubbing bubbles toilet cleaning gel and it takes away almost all of the pee smell. I still wipe the floors and walls daily or every other day but its gotten considerable better! Mom of all boys here! Vinegar wash on the entire bathroom – I mean the entire thing. Walls, cabinet near toilet, all of the toilet, etc. Wash the shower curtain and rug frequently, or eliminate the rug completely! I don’t have boys but my sister does. She uses pet urine spray. Waits a while then wipes it all with bleach water. Seems to work. My 5 year old still misses a lot. A think he misses more now than he did when he was 3 because he is always in a hurry now. We tried getting him to sit down, but it is not always as easy as some people make it seem. My son refused to potty train sitting down. He knew his dad stood and if could not stand he would not go on the potty. The choice was to let him stand and get him out of diapers or force him to sit and probably go another year without potty training. I agree with the idea of letting him clean it up himself when he is done, but caution that not all boys are great cleaners and more tends to get on their hands than the cloth or toilet paper. I always go in and clean the light switch and the faucet as soon as he is done because I know if he cleaned urine there will be urine on everything he touched before he washed his hands. I am “a bit” of a germaphobe. The idea of letting him clean it himself turns my stomach, but I know it needs to be done and hope it teaches him a lesson in time. I still go in after him and clean the area with sanitizing wipes or bleach and then the same with the faucets and everything I think he may have touched. I also have a 3 year old girl who makes more, or at least as much of a mess as my son. Obviously she sits, but somehow this girl pees like a boy standing up. She cannot pee straight down to save her life. It goes out through the gap between the actual toilet and the seat itself. My daughter did the same. She needs to scoot further back. I think she was scared agewould fall in. Lol. That’s a good idea. We’ve had a spray bottle with a tiny bit of bleach diluted in water and we’ve used that and it takes away the smell, but man, with a husband and two little boys, my bathroom reeks!!! my daughter and son share a bathroom. After the smell problem appeared for us, my husband had a talk with my son about proper aim and all that. And, we started making him clean it up. The problem has mostly cleared up. And his sister will usually rat him out (ahem, of course I mean, inform me!) if something needs to be taken care of! Hey Crystal. I have 4 boys and know ALL about the smell! I make them wash the bathrooms and I do a deep clean every once in a GREAT while. If they are going to stink it up, the can clean it up. I have 4 boys and one girl. First of all, I let her use my bathroom/shower, lol. Second the boys clean their bathroom every day. It had to be approved by me or dad before wet call it done. I’ve always wanted to get vinyl target decals. I’ve read studies that when used in men’s public restrooms decals reduced spillage by 80%. So I think that will help with the smell. My son’s have to wipe down the entire toilet, not just the seat and floor. 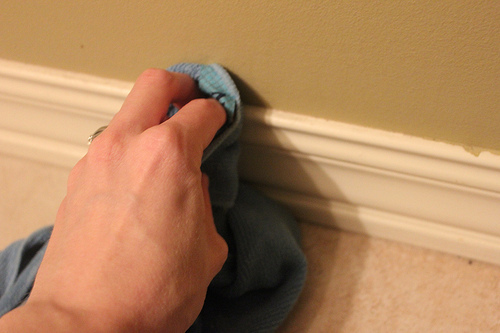 I wash the walls, floors and baseboards every time I clean the bathrooms (with two little boys and two grown boys). I have 4 boys…3 are using the bathroom! All I can say is DISINFECTANT WIPES!!! I didn’t read all the comments, so this may already be here, but I have conquered the boy bathroom smell (at least for a week at a time) with two things. Leave a 1/2 cup vinegar, 1/2 cup water mixture somewhere in the room – for us, it’s a high windowsill. Make a paste of baking soda and vinegar (you may add lemon juice if desired) and seal between the toilet and the floor. Once urine gets there, the smell is so hard to conquer! I make a batch of paste and keep it in a tupperware container to use weekly. The paste will harden and I use a knife to get it out, but it absorbs and deodorizes the urine. I wipe down the potty two or three times a week and once a week mop and redo these two things. We can have company over again without worrying about the odor!! I love BacOut for my boy’s bathroom….spray all around (wall/floor) and on the outside of the toilet, let sit for a few minutes and wipe down with a wet rag….do this once a week or so and it keeps my bathrooms smelling fresh! I forgot to mention that not only do I have 4 boys and a husband, I also run an in home child care so I have all ages and stages and abilities of boys from just potty-training to grown, so if BacOut works here, it should anywhere! I read through ALL the comments and don’t believe I saw these- to PREVENT “pee” grout- go to home improvement store, buy grout sealer- takes a little work, but makes your grout non-porous, so it doesn’t soak up liquid. Paint your bathroom with semi-gloss paint (or kitchen/bath paint). It is wipeable and again, won’t soak up liquid. You can also recolor/reseal your grout with a product that rolls on. Don’t replace your toilet, unless you want to- it is porcelain and won’t hold smells. The smell is coming from the caulk or wax ring around it (or seat area). Watch a you tube video to see how to change the wax ring- it’s a little work, but not bad. Also, clean the floor while the toilet is off the drain. My motto: you haven’t got it all, until you clean the wall! So I’m not imagining things. The ‘boy bathroom smell’ is a real thing, huh? Any tips would be great. spray bottle with water and vinegar…always helps me take care of any pee smell. I recently had someone tell me about a boy trick I had never heard of….put a drop of food coloring in the water and let them aim. Cool things happen when they hit it. Hi! I have your solution and it is the most effective way to combat that problem. Trust me, it works miracles and you can clean your entire bathroom with it with out any fussy or stinky chemicals smells. Hydrogen Peroxide! It works for everything in the bathroom, except the mirrors, lol. If you ever get a lil mildew on shower curtains, spray it on there. The Hydrogen Peroxide will elimate and sanitize your entire bathroom. Just buy a big bottle from the Dollar Tree and put a squeeze trigger nozzle on it and spray away, wipe up afterwards and your bathroom will be fresh and clean. 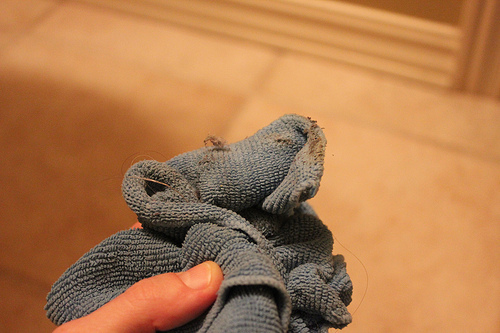 So the biggest trick that has worked for me is to use the cleaners designed for dogs and cats. Go to the pet store, i picked up one called natures miracle (about $5) and it has lasted me well over a year. Between boys and their friends, its impossible to make everyone sit down when they go. I’ve found this stuff brings the bathroom back to a neutral scent (and color), no matter how long I have waited between bathroom cleanings. Good luck! This is from one article about it…but there are hundreds out there. Wow, I found this discussion fascinating! My son will be entering the potting training age soon. I had no idea what little boys could do to a bathroom until I read some of these comments. Lol. I guess we are in for a ride! what is a good non-toxic cleaner to use to clean the floor around the toilet? Mine is really gross. I need something that wil totally sanitize it. Help! My husband was taught to sit down by his mom (she has 7 boys so it was taught to all of them I am sure). Also, according to our religion men have to sit down. The prob is, my husband refuses too! Is there any way to “train” a grown man to always sit down? I don’t clean as often as I should (It had never occurred to me to clean the wall and vanity before I read the comments lol). Have u ever used bleach?